Unique Desk Fan with PU Leather Handle, The small desktop fan can be hung up with durable PU leather handle and its smooth surface will give you a sense of comfort. The RPM of this small fan is 2200, powerful enough airflow to keep you or your computer cool with 3 big blades in hot weather. Just rotate and pull out the fan grill for regular cleaning and the angle can be adjustable with two metal support, very convenient to use, the office fan is also lightweight which is easy to carry around. With 3ft long USB cable which is same as android phone USB cable, this USB fan works with USB charger, laptop, computer, MacBook, power bank, AC adapter and other devices with USB output. This stylish desk fan is perfect for office, home, dormitory and library. And the little portable fan can save your desk space as well. 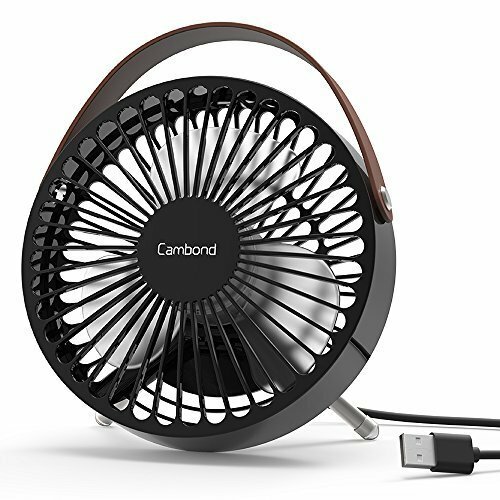 The portable fan comes with 1 Year Warranty and 30 days hassle free refund or return service from Cambond. If you have any questions about this product by Cambond, contact us by completing and submitting the form below. If you are looking for a specif part number, please include it with your message.